Summer has always been my favorite season. It must be my Mediterranean blood because I couldn’t live without sunshine, summer breezes, fresh veggies from the garden, or warm weather. Summer also means barbecues with family and friends, long, lazy days, open windows, the sound of thunderstorms, and cool treats. This week, Lola of Lola’s Cocina is kicking off the summer season with #PaletaWeek. Paletas are the Mexican version of popsicles, but paletas are so much more than overly sweetened frozen water. Paletas contain chunks of fresh fruit and they come in hundreds of tropical flavors. I still remember eating my very first paleta. 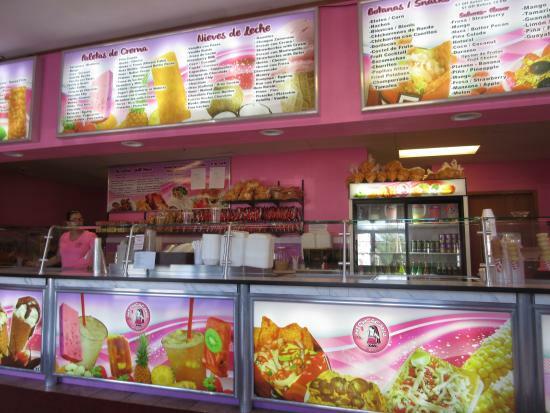 I was living in Puebla, México, and my host family took me to a Michoacana in town. I had no idea the world of paletas and aguas frescas even existed until my experience at this store. I ordered a paleta de guanábana, a white and creamy tropical fruit that tastes like a combo of banana, pear, and strawberry. It was mouthwateringly delicious. I recall that the paleta contained the large seeds from the guanábana. You are not supposed to eat them, but the sheer fact that they were mixed in with the paleta demonstrated the freshness of the product. I wanted to bring you an equally fresh and tropical paleta flavor to kick off summer. My mom makes an amazing dessert that contains lime curd and caramelized pineapple, so I decided to play off of this flavor combo for these paletas. These contain a layer of pan-roasted, caramelized pineapple that is laced with cinnamon. The sweetness of the pineapple is balanced by a cream layer that contains a hint of tartness from the addition of sour cream and lime zest. The hardest part of making paletas is waiting for them to freeze! Happy summer! Visit Lola’s Cocina for delicious paleta recipes all week. →Melt the butter in a medium-sized skillet. Add the pineapple and cook over medium-low heat for about 10-15 minutes until it starts to become golden on all sides. You will need to stir the pineapple every few minutes so it doesn’t burn. →Once the pineapple is golden-colored, add the brown sugar and cinnamon. Stir to combine. →Then, add the vanilla extract. BE CAREFUL! The pan will hiss and steam when you add the extract because it contains alcohol. Make sure your face is not directly over the pan. →Stir for an additional 30 seconds to a minute until the pineapple is covered with a beautiful caramel glaze. Remove from heat. 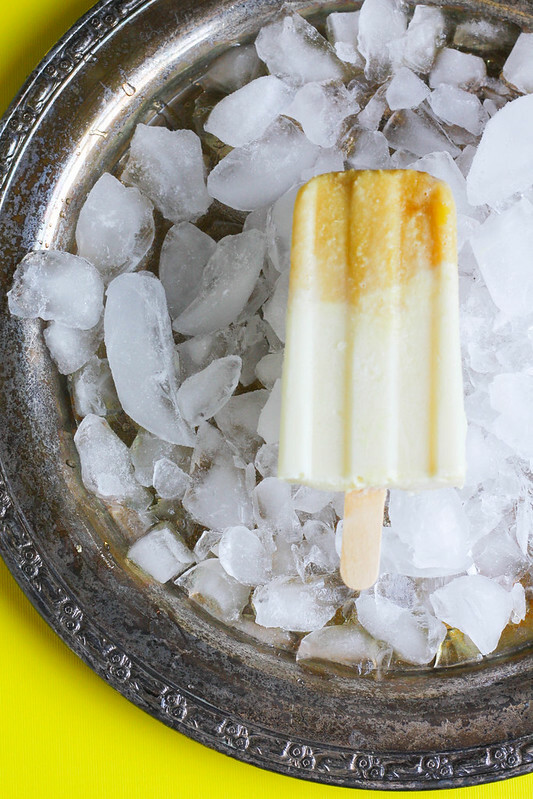 →Place a 1-2 pieces of caramelized pineapple into the bottom of each popsicle mold. * Then, put the rest of the pineapple in a blender. 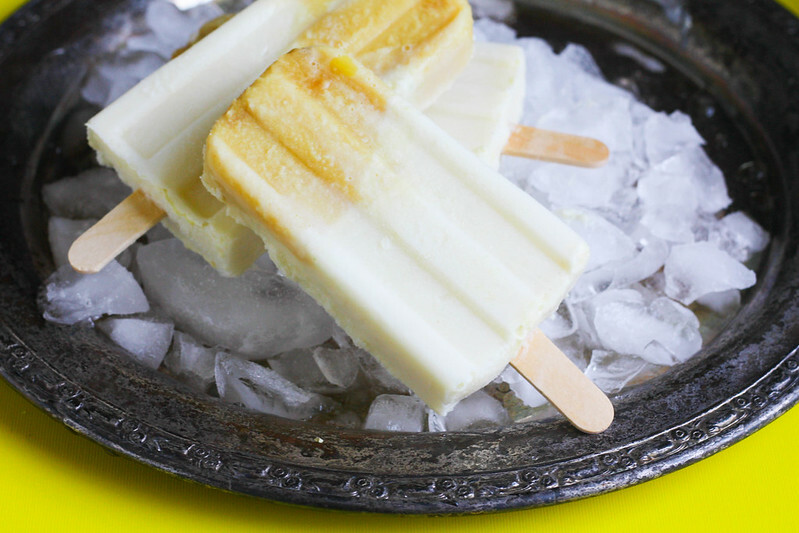 →Spoon about 1+ TBSP of the pineapple mixture into the bottom of each popsicle mold. Make sure you distribute the mixture evenly and use all of it. →In a clean blender, add all of the ingredients above. →Blend on medium-high speed for 1-2 minutes until thoroughly combined. →Pour the cream mixture on top of the pineapple mixture to fill each mold. Be sure not to overfill the molds because they will expand slightly in the freezer. →Place a popsicle stick in each mold and place the molds in the freezer for 4-6 hours or overnight. →To unmold, fill your sink or a bowl with warm water. Dip your popsicle molds in the water for 10-20 seconds to loosen the popsicles. Gently wiggle the popsicles to remove from molds. →Serve immediately or keep in the freezer until ready to eat. If you are using frozen pineapple make sure to thaw it before adding it to the pan. If I’m using frozen pineapple, I like Trader Joe’s Pineapple Tidbits. Do NOT use canned pineapple. Opt for organic ingredients when possible. Trader Joe’s carries organic milk, sour cream, and butter. I used brown sugar in this recipe because I like its more subtle flavor. However, if you live in Mexico and you can’t find brown sugar, piloncillo would be a nice substitute. 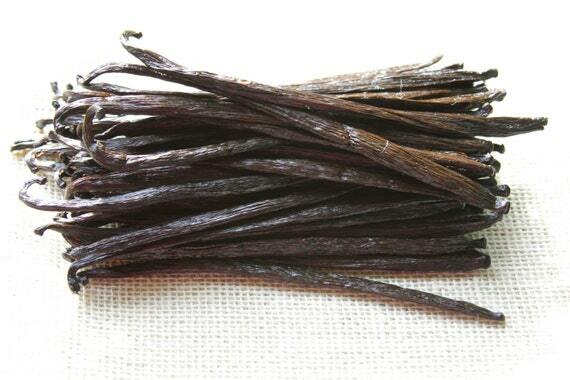 If you are looking to buy Mexican vanilla beans to make your own vanilla extract, check out our Etsy shop. We source beans from small farms in Papantla, Veracruz. This is the popsicle mold that I use. 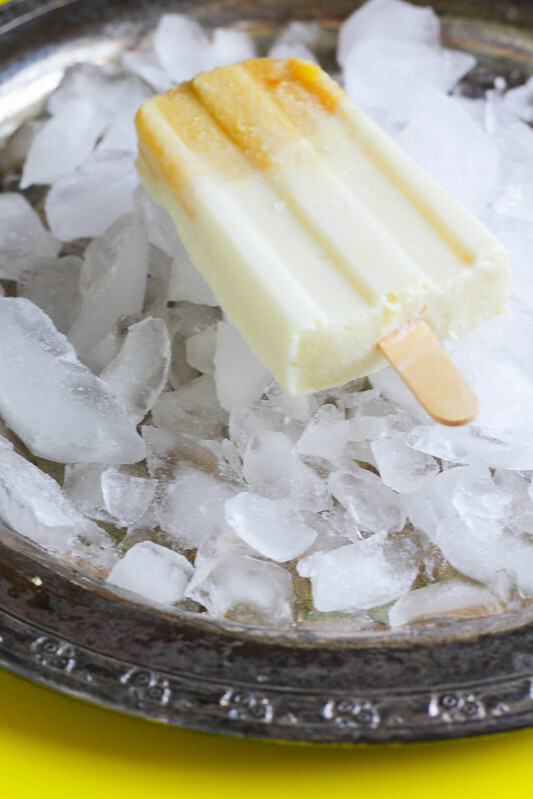 This recipe makes 10 paletas.